Don't miss today's Transit of Venus! This celestial event is when the planet Venus passes directly between Earth and the Sun. It only happens twice each century. The last time it happened was in 2004. Because of the distance, Venus doesn't actually block the Sun as in a lunar eclipse, but instead appears as a small black dot moving across the Sun. Please remember: Do not to let your children look directly at the Sun. Doing so can cause permanent eye damage. 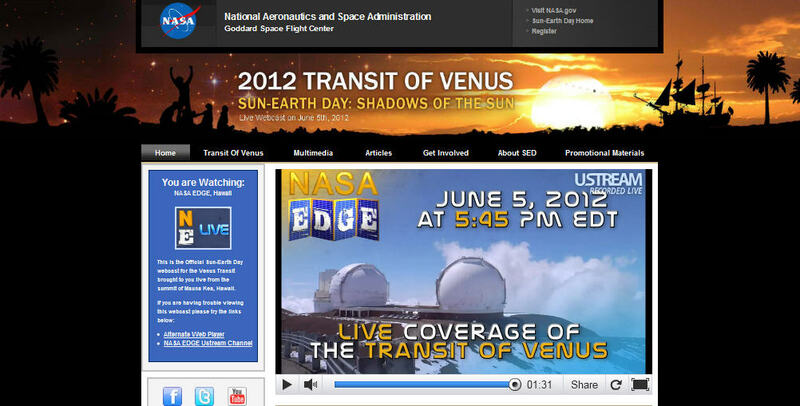 Instead, you can watch it safely via the NASA site which will be streaming live coverage of the event. You can also visit the site to learn how you can safely view it from home. If you miss it today, the next time this will happen is in 2117! I heard about this on the radio, then promptly forgot all about it. Luckily, I happened upon your link just before I put the kids to bed so we watched a couple of the videos and live feed for a few minutes and they seemed pretty interested. A great reminder of how huge the universe is!